Office Marshal® Black chair mats for carpet floors made from 100% newly manufactured polycarbonate - Designed to ensure genuine quality and complete reliability. The durable polycarbonate structure of this mat prevents against the everyday wear and tear caused by office chair casters and helps preserve the appearance of your floor. Due its many notable properties such as high impact strength, heat resistance and high transparency, polycarbonte is currently the most reliable material for the manufacturing of chair mats. 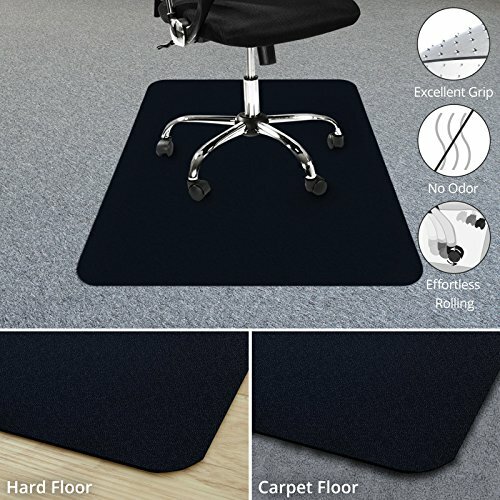 With the users needs in mind, these mats are ergonomically designed to allow for effortless movement of office chair castors (wheels), in turn helping reduce stress in the workplace and also considerably reducing leg and muscle fatigue. Intended for use on medium to low pile carpets (up to 15 mm in thickness) all mats are fitted with grippers on the underside which are designed to keep them firmly in place while in use. For its many beneficial properties, this mat along with several others from the Office Marshal® range are Certified by TÜV Rheinland (a global provider of technical, safety, and certification services throughout the world). Designed to prevent against wear and tear caused by office chair casters. Allows your office chair to move freely while carrying out daily tasks, helping considerably reduce the risk of leg fatigue. Studded underside holds the mat firmly in place. Suitable for use on low-medium pile carpets (Max. pile: 15mm). If you have any questions about this product by Office Marshal, contact us by completing and submitting the form below. If you are looking for a specif part number, please include it with your message.